The exploration area of Argozelo for ores tunsten, tin, gold, silver, copper, zinc, lead and antimonium is located in the NE of Portugal, around 500 Km from Lisbon and 30 Km to the SE of Bragança. This area is easily accessible by motorway and paved roads. The Argozelo sector forms part of the extensive Chaves – Miranda do Douro antiform. This antiform constitutes a veritable mineralized NW-SE axis comprising various Sn and W deposits that were mined intermittently from the late eighteenth century to the mid/late twentieth century, as in the case of the Ervedosa, Monte Agrochão, Murçós, Pica Porcos, Paredes, Fontainhas, Ribeira and Argozelo mines. The area is covered by power grids and water systems and both the local authorities and the local population are highly receptive to mining activity. The Argozelo area belongs to the Galiza Média Trás-os-Montes Zone (ZGMTM – Parautochthonous) at the southern edge of the Peritransmontano group, in the region of the Chaves – Miranda do Douro antiform. This sector includes rocks from the Silurian age belonging to the Upper Quartzite Formation (schist quartzite and quartz phyllites) and the Upper Schist Formation (siliceous and carbonaceous grey schists and siltstone), as well as from the Devonian age, represented by the Culminant Schists and Greywackes Formation (alternation of millimetric pelites and siltstones and quartz wacke). The entire sequence was affected by the Hercynian orogenesis through various stages of deformation, with the installation of syntectonic to late tectonic granitoid masses also occurring during this period. The mineralization associated with this Argozelo sector essentially comprises quartz vein structures with sulphide mineralization and tin (Sn) and tungsten (W) association. 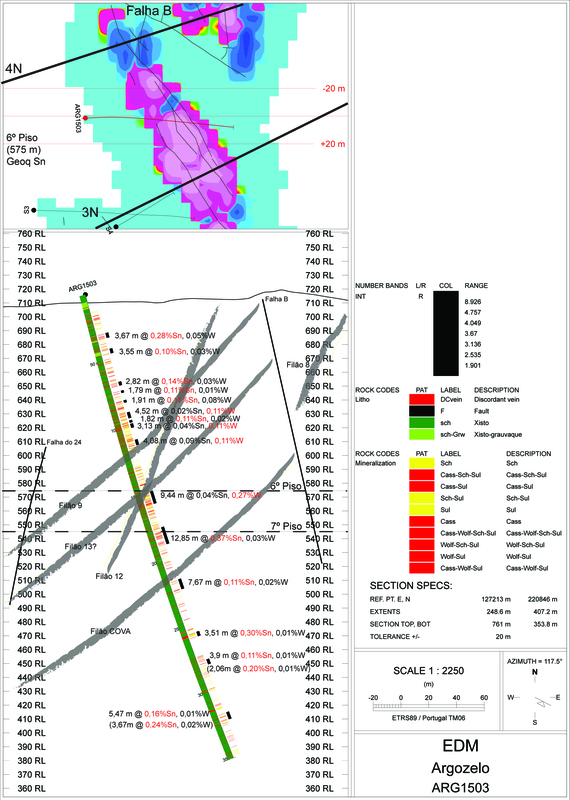 Occurrences of gold (Au) are also found in this sector related to the late Variscan phases (ductile-brittle to brittle) and which developed systems of fractures in a principal NNE-SSW direction that control the installation sulphide quartz vein structures with the possible presence of gold. These alignments are parallel to the great Régua-Verín and Vilariça faults). 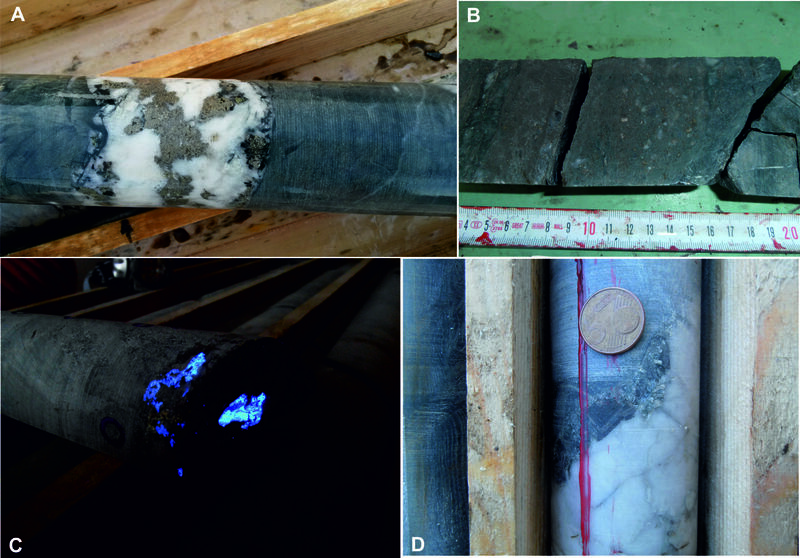 In the Argozelo area, several styles of mineralization are identified. These are distinguished by volume, age, type of mineralization, mineralization bearing structures and mineralization processes. Generally cassiterite, wolframite and scheelite occur in a complex network of sub-vertical quartz veins, but also in hydraulic breccias, disseminated in greisen, and, possibly, the occurrence of scheelite disseminated in calc-silicate zones associated with Silurian formations. Within the Argozelo area, there are several former mines where tungsten and tin ores were extracted from the nineteenth century to the 1980s. The most important were the mines of Paredes, Ribeira and Argozelo. Paredes mine consists of small open pit excavations and galleries in a greisen with cassiterite and quartz veins (N30ºE, N30ºW) with cassiterite, wolframite and various sulphides. The Ribeira mine closed in 1986. 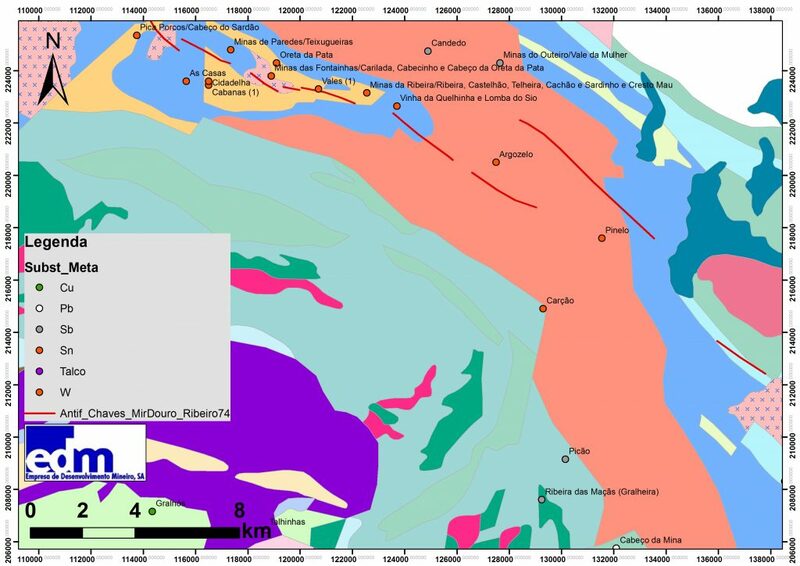 Four levels of galleries were mined to a depth of 140 m, with the galleries extending for more than 500 m. The mineralization of tin and tungsten occurs in a system of quartz veins running NW-SE. Further to the SE of the former Ribeira mines lies the channel sector of the Sabor river, which demonstrates potential for having mineralized veins in N20º-45ºW direction and an average inclination of 75ºSW, similar to those mined intensively in the former Ribeira mine. As in the former mines of Ribeira, the presence of a greisenized granite dome (with lithogeochemical results of 0.09% Sn and 0.01% W) was observed at relatively shallow depths and close to the quartz veins, with the lithogeochemical results showing values of 0.18% Sn and 0.01% W. This sector takes on added importance as the Silurian calc-silicate geological units occur herein, which may contain scheelite. The Argozelo mine, the most important in the area, was in production between 1889 and 1984, with mining galleries distributed over 7 levels at a depth of 170 m.
The SFM (Mining Development Service) conducted various studies that identified possible reserves of 0.6-0.7 Mt of ore on floors 6 and 7 and a possible floor 8, which has not been explored. These reconnaissance works indicate the continuity of the mineralized structures below floor 7 with high Sn and W contents. With these indications, EDM undertook prospecting and research work in the Argozelo sector that allowed the evaluation and confirmation of the lateral extension and depth of the mineralized structure of Argozelo. The work carried out consisted of: i) detailed geological and structural mapping indicating mineralized structures lying in a N-S direction at N70ºE and W-NW inclinations; ii) petrographic studies of lithotypes and mineralizations in thin sections; iii) geochemistry campaigns for soil (that indicated maximum values of 576 ppm W and 238 ppm Sn) and rock (with maximum values of 1.82% Sn and 0.97% W); iv) geophysical surveys (IP) that showed that the lateral extension of the vein zone of Argozelo; v) opening of ditches along the veins of Argozelo; vi) 6 surveys over a total of 1,567 m and sampling of probings for geochemical analysis. 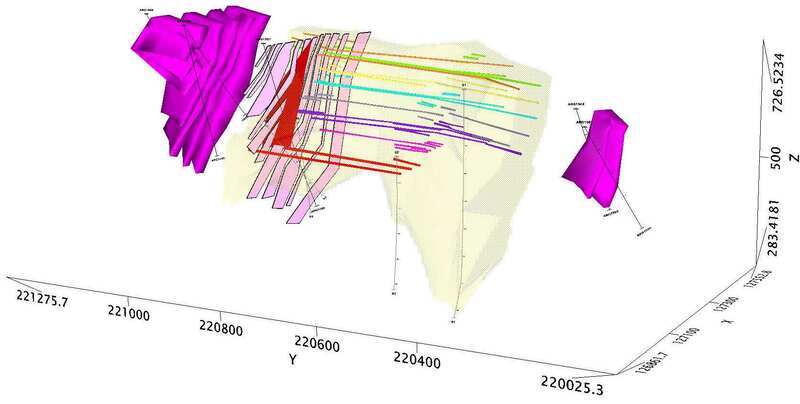 The geochemical data from the soils and rock were also processed geostatistically, and geochemical modelling of Sn and W was performed on floors 6 and 7 and the former galleries of mineralized veins and the mineralization envelope of Argozelo mine. The analytical values of the samples of the probing from Argozelo show levels of SnO2 (max. 10.2%) and WO3 (max. 1.92%) which, associated with levels of Ca (max. 5.29%), reflect the presence of the main mineralogy of this ore deposit (cassiterite, wolframite and scheelite). The ancillary sulphide mineralogy regularly present in the mineralized structures stands out in the analytical values of Cu ≤15,500 ppm, Zn ≤18,200 ppm, As ≤51,700 ppm and Ag ≤50.5 ppm.